Groundworks Texas and Groundworks of Palm Beach County Inc. specialize in palms. Where others may sell a few varieties of palms along with a bunch of other stuff, Groundworks is singularly dedicated to delivering expertise with the palms we offer. We have been doing what we do since 1986 and have learned allot along the way. Here at Groundworks, we don't just sell palm trees; we live in the fields with them. We work with them on the farm and on our customer's jobsites every day, We strive to understand everything about the species we sell, taking the time and making the investment to gather a greater degree of understanding with each new experience. We are experts in our field who can tell our clients how to properly prepare their particular site, how to properly install under their particular conditions and how to properly maintain the material in their particular environment. We operate under a myriad of various site conditions and we are pleased to share our knowledge with our customers and competitors alike. Where delivering at wholesale, we send along field proven installation instructions that are climate specific. We understand the many different micro climates and soil conditions our various customers operate in and we provide competent field proven instruction that is built around those individual site scenarios. We are experts in loading for the long haul & in the logistic associated to being onsite, on time with the right palms. We recognize exactly what our customers and their clients expect to see when the tarp comes off the truck and we see to it that every expectation is met. We ship our palms all over the United States and we also offer exports to the Caribbean, Central America, Europe, Asia and Europe. When installing for our customers, they experience the finest degree of coordination and execution available anywhere in the landscape industry. 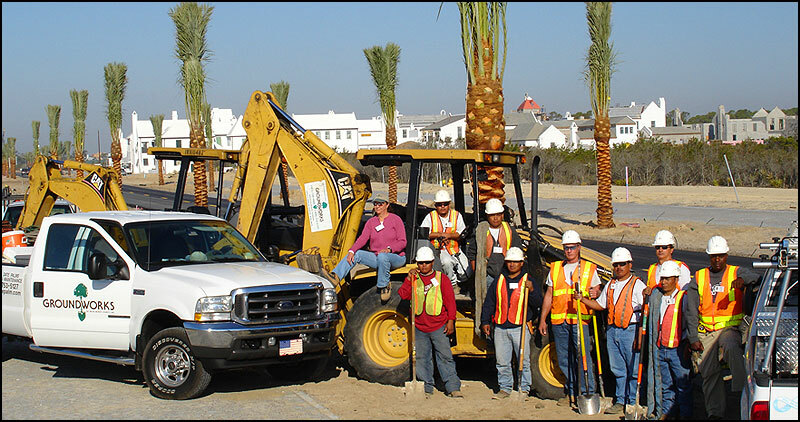 Our teams are manned, top to bottom, by dedicated long term professionals who fully understand exactly what they are doing from the simple front yard operation to the more complex site where a 20,000 pound palm needs to be craned 300 feet out over a two story house and into the backyard. We have 25 years of direct field experience under our belts and we are just plain excellent onsite. Try us and you will see what I am saying. We include a no-nonsense 1 year written warranty that includes post installation Establishment Assurance service maintenance visits and also offer extended warranties where our customers prefer 2 or more years of coverage. If you are looking for an assurance of excellent value for the money you invest in Specimen palms, you have found it. We are a dedicated group of professionals who have devoted our lives to excellence in our field. Our livelihoods stem from an absolute commitment to exceptional quality, unmatched expertise and swift, courteous service. Our goal and our promise is to insure that our palms deliver decades of performance and we take it very seriously. We are Groundworks, we are one of the core realities of our industry and we are interested in talking with you soon. Copyright © 2008-2018 Groundworks, All Rights Reserved.